This is the post in which I proclaim Old Navy is killing it. First with the adorable dresses, and now these? I am totally into small scale animal prints (I'm talking animal shapes, not leopard spots here). Birds, kittens, and puppies, oh my! You're absolutely right, I've been blown away over this last year by how much cute, and fashion forward stuff Old Navy has been coming out with. And who can argue with the prices!? I tried the bow back top on while I was there and it was too low :( It is really cute in person though! I tried on all of these (and the dresses from last week) at my ON the other day and none of them really did it for me. The dresses were OK, just a little too short (I'm 5'11") and didn't do anything for my figure (curvy and hippy). The white bird top is a little sheer, but I liked the blue one, just not enough to spend the money on. I had a $10 off coupon to use and bought a belt, scarf and shirt for my baby. But I have shopped more at Old Navy in the last month than I did in the last half of 2011 combined. Thanks for all of the great posts! I saw that red dog printed shirt in store Monday, and all I could think of was that it looks like the Victoria's Secret dog! :) But yes, they are cute! I've been missing my proximity to an ON ever since I moved to a tiny town that doesn't have one nearby. They are seriously taking up some major trends nowadays. LOVE. I want the kitty one so bad! I do wish it were pink though. I went to Old Navy with my sister the other day and they were out of almost every size. I agree, they are adorable. I've seen the bird one a few times and I've been thinking about picking one up. Great post - I have 2 of the 4! The pink dog one and the white bird one. Love 'em! I have the blue kitty print bow back shirt and I cut out the tag and wear it backwards with a cardi. 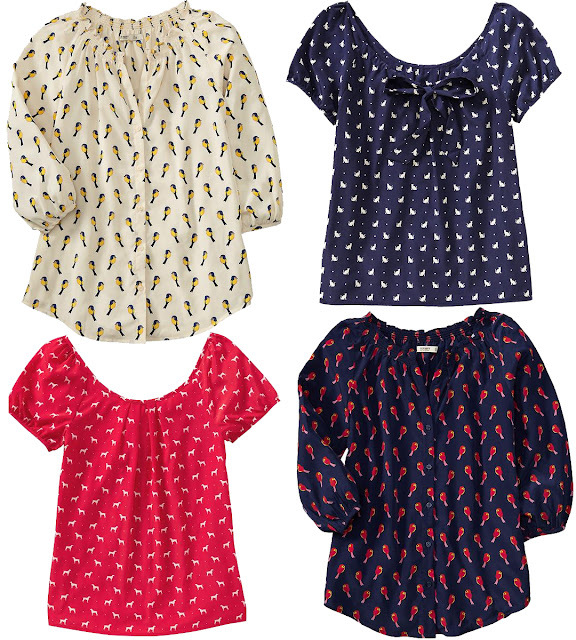 It looks super cute as a bow FRONT shirt :) It's one of my favorite new things!